Not all commercial ice melters are as environmentally friendly as they appear. In order to be effective, and still contribute to LEED® points*, calcium magnesium acetate (cma) prills are usually recommended. But cma is cost-prohibitive and does not perform as well as premium chloride-based products. 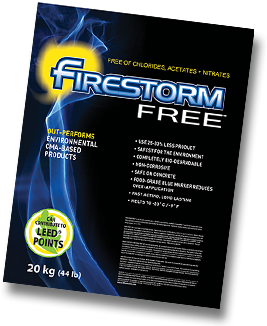 NEW FIRESTORM FREE™ MEETS BOTH CHALLENGES. This new environmentally-friendly product is non-corrosive, contains no chlorides, acetates or nitrates, can contribute to LEED® points* in both Canada and the U.S., out-performs the competition – AND IT’S AFFORDABLE. "Firestorm Free (HCOONa) is an environmentally-preferred de-icing chemical."